In this article, the written words of John Marks Templeton, the founder of the John Templeton Foundation (a.k.a. Templeton Foundation), are analyzed. Theological concepts that govern the Templeton Foundation and their relation to basic Christian doctrine are fully investigated and the source of the Templeton Foundation theological doctrine is identified. Sir John Templeton, knighted in 1987 for services to charity, died at the age of 95. He was an American-born British stock investor, businessman and philanthropist and a legend in the world of fund management. Born in the town of Winchester, Tennessee, Templeton attended Yale University and became a billionaire (he was listed in a 7-way tie for 129th place on the Sunday Times Rich List) by pioneering the use of globally diversified mutual funds. He renounced his U.S. citizenship in 1968, thus avoiding U.S. income taxes  and became a British subject after moving to the Bahamas. He was knighted by Queen Elizabeth II in 1987, the year he set up the John Templeton Foundation. However what is really interesting is that Templeton invested much of his multi-million pound fortune in promoting spiritual and religious progress, writing editing several books about religion and spirituality, including Wisdom from World Religions: Pathways Toward Heaven on Earth. In fact, in 2007, he was named one of Time magazine's 100 Most Influential People (Time 100) under the category of "Power Givers." 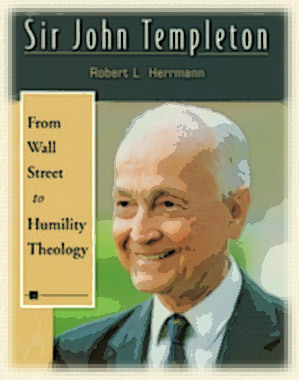 Templeton was given this honor for his "pursuit of spiritual understanding, often through scientific research" through his establishment of the John Templeton Foundation. in 1992 he sold the Templeton Funds to the Franklin Group for $440 million, a move which freed him to devote his time to the work he considered really important — the promotion of religion and spirituality. Unbelievably, Templeton was a lifelong member of the Presbyterian Church and a trustee on the board of Princeton Theological Seminary [the largest Presbyterian seminary] for 42 years serving as its chair for 12 years. “The Interdisciplinary University of Paris (IUP), whose Science and Religion in Islam program was launched in 2004 with support from the John Templeton Foundation, held a major conference in Doha, Qatar this past spring in collaboration with the Al Jazeera Center for Studies (the think tank of the Arabic television network Al Jazeera). The conference, titled "Science, Cultures, and the Future of Humanity," was funded by Al Jazeera, which also gave the event extensive coverage, reaching millions of Arab viewers. For Dr. Jean Staune, founder and general secretary of the IUP, the gathering in Doha was a unique opportunity "to create dialogue and debate between Muslim experts in science and religion and their Western counterparts." John M. Templeton Prize for Progress in Religion. “A brilliant publicist, Templeton guaranteed that his prize would always be worth more than the Nobel, and arranged for the Duke of Edinburgh to present the award at Buckingham Palace, thus ensuring full press coverage. From 1973, when it stood at £70,000, the prize money has risen to £820,000, making the Templeton Prize one of the world’s largest annual monetary awards. It is especially disquieting when people, who call themselves Christians (Billy Graham was awarded and accepted the Templeton prize in 1982, Charles Colson in 1993 and Bill Bright of Campus Crusade in 1996) accept the Templeton Prize for Progress in Religion, since the ‘judging’ committee is made up of leaders of the world’s five major religions (Hinduism, Buddhism, Islam, Judaism, and Christianity). And while Templeton claims to honour all religions he is strongly in favour of the Unity School of Christianity and the Church of Religious Science. He commends them for viewing man as "an expanding idea in the mind of God," and for striving for "progress" in religion because, "as mind advances [evolves], the old forms [of religion] die..." (The Humble Approach. P. 60). “Beloved, while I was making every effort to write you about our common salvation, I felt the necessity to write to you appealing that you contend earnestly for the faith which was once for all handed down to the saints”. Another so-called Christian leader that has been associated with the Templeton Foundation is Rick Warren, pastor of Saddle Back church and author of the Purpose Driven Program. According to Media Transparency… Between the years of 1998 and 2004, The Templeton Foundation made 43 grants, totaling $3,509,971, to the Association of Unity Churches. , which begs the question.. What does Unity believe and teach? Q What are the basic tenets of the Unity teachings? Q Do Unity ministry teachers believe in the divinity of Jesus Christ? A Yes. Unity church leaders teach that the spirit of God dwelt in Jesus, just as it indwells every person; and that every person has the potential to express the perfection of Christ, as Jesus did, by being more Christ-like in everyday life. Q What are Unity's distinctive characteristics? Jesus: We believe that Jesus expressed his divine potential and sought to show humankind how to express ours as well. We see Jesus as a master teacher of universal truths and as our Way-Shower. In Unity, we use the term "Christ" to mean the divinity in humankind. Jesus is the great example of the Christ in expression. The Nature of Humankind: We are each individual, eternal expressions of God. Our essential nature is divine and therefore inherently good. Our purpose is to express our divine potential as realized and demonstrated by Jesus and other master teachers. The more we awaken to our divine nature, the more fully God expresses in and through our lives. More about The Unity School of Christianity. Also see Roots of Evil.. It is unlikely that many Christians are aware of the the common roots of some popular beliefs in the church and the New Thought beliefs without. Templeton is also linked to some very important and wealthy people that have been known to be involved in Globalism, both politically and religiously. Comment: Except that the Bible disagrees with the Persian Scriptures. Jesus also, spoke of the broad road; but far from commending it, He said it led to "destruction" (Matthew 7:13). And why shouldn’t we reject ideas from other religions, when Scripture explicitly tells us that NO man can come to the Father except through Jesus. When The Bible warns us NOT to have anything to do with pagan practices and idols and asks “what agreement hath a temple of God with idols? for we are a temple of the living God; even as God said, I will dwell in them, and walk in them; and I will be their God, and they shall be my people. [2Corinthians 6:16].. WHY should I look to any other religion… all of which lead people to perdition. Do not be fooled.. .. any person who can make a statement like the one above.. IS NOT A CHRISTIAN. Comment: The Old Testament draws a clear distinction between the Creator and created beings. While God is omnipresent (everywhere all at once) He is not the physical universe He created. In the opening chapter of Genesis we find eight instances of the phrase 'Then God said, Let ...', and ten instances of 'God said' all in reference to the words He used as he created the universe and everything in it. Like every cause, the Cause of the universe must be independent of its effect. Thus, the first cause must be separate from the universe, not a part of it. From ancient times, the Bible has clearly presented God as non-physical, a Spirit who cannot be contained, even by the heavens. And Scripture records God's own testimony . . .
Templeton: According to Templeton, the world's scriptures (including the Bible) "were written... [by] men whose minds were limited by cosmologies long since discredited" (The Humble Approach, P. 61). Nor does the Bible accurately record the words of Christ, because those who reported them "could write down only what they understood... [as] ignorant and primitive... Jews." (The Humble Approach, Pages 39-40). "No one should say that God can be reached by only one path. Such exclusiveness lacks humility....New, freer, more imaginative and adaptable creeds will have to be devised in order that man's God-given mind and imagination can help to build the kingdom of heaven" (The Humble Approach, 46,55). As for Templeton's "heaven,"
Comment: On the contrary, Paul affirmed that every word in the Bible "is given by inspiration of God" (2 Tm 3:16); Peter said of the Bible, "holy men of God spake as they were moved by the Holy Ghost" (2 Pt 1:21); and the psalmist said, "For ever, O LORD, thy word is settled in heaven" (Ps 119:89). While Jude 1:3. says “Contend for the faith that was once for all delivered to the saints”. Templeton: “No one should say that God can be reached by only one path” (The Humble Approach Pages 46,55). Comment: This is a totally ridiculous statement.. the “doctrinal formulation” has never changed. For a heresy to exist there must be an authoritative system of dogma designated as orthodox. In Christianity the authority is, and always has been, Scripture. Any departure from the foundational and critical doctrines of Scripture are deemed heretical, regardless of how many people believed the heresy at the time. And as far as Templeton’s statement about some people appearing more spiritual or closer to God than others.. Please note the use of the word “appear” because this is all that it is.. appearances. No human made up the doctrine of Jesus being the only way to God.. Jesus made this claim, saying "I am the way, and the truth, and the life; no one comes to the Father, but through me" (John 14:6). "For unless you believe that I am He, you will die in your sins" (John 8:24). Christ's apostles later affirmed His claim: "And there is salvation in no one else, for there is no other name under heaven that has been given among men by which we must be saved, " Peter says in Acts 4:12. Paul writes "For there is one God, and one mediator between God and men, the man Christ Jesus" (1 Timothy 2:5). Templeton: "Maybe one of the attributes of God is change" (The Humble Approach. Page 52). Templeton: "the idea that Heaven is a locality situated on the other side of death and that we must be either wholly in heaven or wholly in hell, has stunted progress in religion and caused it to march out of step with the rapid progress of business and science. Should we not see all around us that heaven is like sanity or wisdom? Few are totally without it. It usually comes gradually, not all at once. Some travel back and forth between heaven and hell... Heaven may be the union of our spirit with God's spirit in a constant striving and studying to become like Him" (The Humble Approach. Page 97). Comment: In spite of what the average Christian believes “love” was not at the core of Jesus’ message. The Romans wouldn't have crucified someone whose main crime was telling Jews to love them and turn the other cheek! Jesus’ core message was summarized succinctly in Mark 1:15, where Jesus proclaims, "The time is fulfilled, and the kingdom of God has come near; repent, and believe in the good news." The phrase "kingdom of God" appears 53 times in the New Testament gospels, almost always on the lips of Jesus. The synonymous phrase, "kingdom of heaven," appears 32 times in the Gospel of Matthew. Throughout the accounts of Jesus' ministry, he is always talking about the kingdom of God. Jesus uses the Greek phrase he basileia tou theou, "the kingdom of God." The word basileia could sometimes refer to a locale over which a king ruled, but it's primary meaning in the first-century was "reign, rule, authority, sovereignty." (The same was true of the Aramaic term, malku, the word actually spoken by Jesus.). So when Jesus proclaims that the kingdom of God has come near, he doesn't mean that a place is approaching like the giant comet in the movie Deep Impact, but that God's own royal authority and power have come on the scene. "God's reign is at hand. God's power is being unleashed," Jesus says. "Turn your life around and put your trust in this good news." Part of the is that most people are not clear on the location of the kingdom of God. The language of Mark 1:15 certainly suggests that God's reign is coming on earth. This fits, with the promise found repeatedly in the Hebrew prophets: someday God will come to reign on earth, establishing justice and peace for his people and, indeed, for all nations. Our Father in heaven, hallowed be your name. Your kingdom come. Your will be done, on earth as it is in heaven . . . . (Matt 6:9-10). In other words, we are to pray that God's reign will be experienced on earth as it is right now in God's own heavenly presence. When God's rule is completely established in this world, then all things will be ordered according to God's perfect design. Templeton: ““I am hoping to develop a body of knowledge about God that doesn’t rely on ancient revelations or scripture (the bible)… The main purpose of the Templeton foundations is to encourage enthusiasm for accelerating discovery and progress in spiritual matters” (The Humble Approach. Pages 135-139). Templeton: "The basic principles for leading a 'sublime life'... may be derived from any religious tradition, Jewish, Muslim, Hindu, Buddhist and others, as well as Christian" (Discovering the Laws of Life. Pages 6-7). Comment: You can live as “sublime” a life as you want provided you have no objection to going to hell at the end of it. by Robert A. Herrmann Ph. D.
30 NOV 2002. Revised 4 DEC 2002. ABSTRACT: In this article, the written words of John Marks Templeton, the founder of the John Templeton Foundation (a.k.a. Templeton Foundation), are analyzed. Theological concepts that govern the Templeton Foundation and their relation to basic Christian doctrine are fully investigated and the source of the Templeton Foundation theological doctrine is identified. At the end, a link to a recent but different analysis by AIG is also provided. In past years, a close associate of the Templeton Foundation has tried to convince me to give up my strict Biblical stance and to return to the fold, so to speak. This I have steadfastly refused to do. In what follows, I use the 1990 written statements of John Marks Templeton as they appear in the 1992 and 1996 issues of "Who's Who in Theology and Science." This written expression of his and the Templeton Foundation's philosophy, which appears from all prevailing evidence to be accepted in complete detail by Templeton and members of his foundation, is couched in a proposal format where many statements are qualified by such terms as "perhaps," actually meaning probably, "maybe" and other such qualifiers. This is not an unusual modern method to express ones philosophy. It is done in this manner so as not to give the appearance of an individual espousing absolute knowledge and allows for future modifications. The theology portions of these writings have not been modified. The theology stated in the document is clearly that followed by the John Templeton Foundation with its adherence to the notion that various "scientific" findings require a vast reinterpretation of the Scriptures, at the very least. This is especially so when the "scientific" findings require acceptance of either cosmological or biological evolution as defined by the atheistic community. As I have shown in my research, this reinterpretation requirement is utterly false. No interpretive modifications are need; no changes whatsoever from the most literal Scriptural meanings are necessary when a particular interpretation of the scientific model I term the General Grand Unification model (GGU-model) is applied. Members of this organization continue their efforts to prevent my research findings from being properly disseminated to the public since my work contradicts this organization's absolute philosophic stance. As I quote from this expression of the Templeton theology, I will not include many of the qualifying expressions mention above. I will not quote this document in full but present only the pertinent portions. Templeton does believe in a god. However, as will be shown, if these theological statements are accepted as fact, then that god is not the God described within the Bible. This statement is, indeed, Scriptural and as I have shown via mathematical models it is a scientifically rational statement. Indeed, one of the Templeton Foundation's present day surrogate organizations, the American Scientific Affiliation (ASA), published my first paper on certain results of my scientific modeling techniques that includes such notions ["The reasonableness of metaphysical evidence," J. of the ASA, 34(1)(1982):17-32.] When the then ASA director, Robert L. Herrmann (no relation), announced that the ASA would concentrate upon the notions of theistic evolution and would consider Genesis 1 as but myth, I removed myself from membership. does contradict the Scriptures in that the God (of the Bible) never changes in any respect. Although we cannot know all the attributes of God nor all of His purposes, they never change. He can be trusted to never change His mind. If the leaders of the John Templeton Foundation were truly interested in scientific research that reveals new information about the attributes of God, then it would herald and promote the GGU-model interpretation that shows that the behavior of all natural-systems is absolutely associated with the behavior of a deity. There are many theological interpretations for the intelligent design aspects of the GGU-model. Nevertheless, one of these interpretations points directly to the God of the Bible as the Creator and the absolute validity of the literal Genesis 1 scenario. Since this organization and its surrogates continue to ignore or belittle these findings, there can be no doubt that the theology they wish to foster is counter to the major attributes displayed by the Biblically described God. This fact will be reinforced shortly. Also, it's clear that this statement is a lie. This organization, most certainly, resists the progress I have made in advancing knowledge that details relations between the Biblical God and the behavior of each natural-system within our universe. Further, it resists any findings that question various atheistic theories that contradict a literal Biblical interpretation such as aspects of biological evolution. The term "spiritual" is used, and it seems to mean an incorporeal domain. However, this term seems to have as many definitions as there are different organizations that write about this concept. It is enough to say that Templeton acknowledges elsewhere that his thoughts on this matter are some of the more fined notions of the New Age movement. He mentions Unity and Religious Science as well as aspects of Christian Science. Finally, I mention that both the John Templeton Foundation and the Discovery Institute of Seattle, WA, supply funds to promote restricted intelligent design theory. This theory satisfies the universal god theology of the Templeton Foundation in that it is such a weak theory that it points to no specific deity as a possible cause for such a restricted design. Indeed, Dembski, who introduced restricted intelligent design in 1996, has stated many times that he considers this lack of a causal connection as a significant and important aspect of restricted intelligent design theory. General intelligent design theory (GID) as developed from 1978 through today by myself (see "Science Declares Our Universe Is Intelligently Designed") also has an "interpretation" that does not point to a specific deity. However, among various theological interpretations, one does point directly to the Creator as He is described within the Bible. This, of course, is why members of both the Templeton Foundation and the Discovery Institute do not promote GID since they want to hide the fact that the scientific GID model exists and has this specific interpretation. The following is an article from Answers in Genesis [AIG], which discusses the Templeton Foundation's attempt to seduce Bible believing Christian churches to abandoned their fundamental beliefs. Increasing numbers of evangelical colleges around the world are accepting large monetary 'awards' for running courses that promote evolutionary teaching and millions of years. It is not that evangelical colleges are being targeted specifically. The US$10,000 (Aus$18,000) award is available to any tertiary institution that will host an approved course. Half the money goes to the college and half to the lecturer who runs the course. Institutions that have already run such courses include Bible College of New Zealand (BCNZ), Bible College of Queensland (BCQ), St Marks National Theological Centre in Canberra, Tabor College in Adelaide, Oxford University in the UK, and Yeshiva (Jewish) University in New York. They have all received funding from the John Templeton Foundation in the USA to run courses on the relationship between science and religion. The Templeton Prize is ‘awarded annually on the decision of a panel of judges from religions of the world today’  to ‘a living individual who has shown extraordinary originality advancing the world's understanding of God and/or spirituality.’  It is a monetary award, intentionally set at a higher value than the Nobel Prize and is currently worth £700,000 sterling. Problem: if death was not the punishment for sin, what does this do to the whole reason for Christ's death on the cross? All of this shows that the Templeton Foundation in its philosophy and ethos is neither Gospel-oriented nor concerned with upholding the authority of God's Word, the Bible, but often rewards those who oppose Biblical Christianity. The Foundation's Web site says: ‘In 1994 the John Templeton Foundation developed the Science & Religion Course Program to encourage the teaching of interdisciplinary courses in science and religion at colleges, universities and seminaries worldwide.’15 The course ‘focuses on the relation between contemporary physics, cosmology, technology, evolutionary and molecular biology, ecology and theology and ethics’. It is administered by the Center for Theology and the Natural Sciences (CTNS), which offers grants of US$10,000 (funded by the John Templeton Foundation and divided equally between the course instructor(s) and the host institution) to colleges and universities around the world to run the course (or one sufficiently similar to qualify). The idea of running a course or conference on ‘bridging the gap between the Bible and science’ could be laudable, if it were not for the fact that where modern science deals with origins it is based on strict naturalism. This is the view that all phenomena can be explained in terms of natural, as opposed to supernatural, causes and laws. In discussing naturalism, the Skeptic's Dictionary says that ‘naturalism makes God an unnecessary hypothesis and essentially superfluous to scientific investigation.’  Thus the terms ‘naturalistic’ and ‘atheistic’ as used here are synonymous. With God excluded from the realm of discussion in scientific research, evolutionism has taken over. Currently, the ‘big bang’ is the naturalistic conjecture as to how everything began. Chance combination of inorganic molecules is the naturalistic opinion of the cause of the beginning of life. And evolution is the naturalistic theory by which animal life has evolved into Homo sapiens. However, these conjectures, opinions and theories should not be labeled as if synonymous with ‘modern science’. Rather, they are the conjectures, opinions and theories of some modern scientists. Collectively they form the logical basis for the false religion of humanism. If Genesis was written as a literal and historic record, then evolution and millions of years cannot be true. Bible Colleges, churches and individual Christians need to recognise and acknowledge this basic fact. See Should Genesis be taken literally? There are two major worldviews. These are the Christian worldview, which is based on the historicity of the Bible, including Genesis, and thus on the truth of Creation, the Fall, the Flood and Babel, and also on the fact of Christ's death, resurrection and future coming again. The other is the non-Christian worldview, which is based on evolution, billions of years, and death and struggle before sin entered the world. There is no conflict between science and theology when both are based on the Christian worldview. Similarly, there is no conflict when science and theology are both based on the non-Christian worldview. Conflict, for Christians, arises when they try to base their science on the non-Christian worldview and their theology on the Christian worldview. No matter how hard one tries, one cannot make two opposites agree.